Today I’m bringing the final two episodes of CLAMP’s Internet Radio show, Komugikotoride no Yonshimin. I’m not going to write any summaries for these ones, since they both are basically “summary” episodes. In #48 they summarize all 17 guests that appeared on the show during its two-years run, making remarks about each one of them. In #49 they look back at the last two years pointing out some highlights such as CLAMP’s visit to the USA and Korea, the Tsubasa Tokyo Revelations screening and New Year’s events, Mokona’s birthday party etc. The final episode is the longest of all with nearly one hour. File type: MP3 – 192 Kbps. I would like to thank everybody who downloaded these and to those who have contributed with translations. A very special thanks to Yoshiyuki, without whom I wouldn’t be able to share these. Thank you! You can download all previously released episodes in this link. I love this illustration everytime I see it *-*. But now that I’ve stared at it for the 4th time, I’ve realized that the thing that is covering CC’s chest is very very… err… not covering it xD. 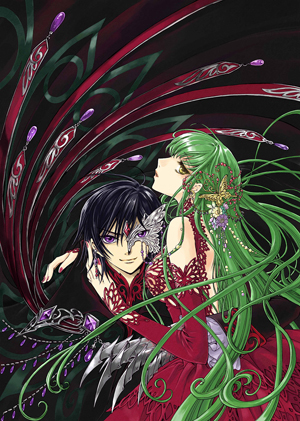 And Lelouch has another claw thing, hehe. I like it too! That’s why I keep posting different/better versions of it. And only now I am convinced that CLAMP didn’t use CG to paint this one. >I’ve realized that the thing that is covering CC’s chest is very very… err… not covering it xD. Ohkawa writing a TV drama? I would love to see that. Were she to do one, I would hope it would be stay in the confines of realism and not tromp off to supernatural stuff like xxxHOLiC or THE END OF THE WORLD like X. As great as those things are, I don’t think their subject matter fare too well in dramas. >Ohkawa writing a TV drama? I would love to see that. Yes, it’s really a great illustration. Oh yeah, I had seen it in yahoo auctions, but thanks for the link! =) Very great pic indeed. Also, thanks for all the news and clamp related things you post. Dou iteshimashite! ^__^ It’s my pleasure, honestly. It’s a pity that I don’t understand a single word that they say. But in any case I’ve downloaded all episodes. Thanks chibiyuuto for this – you are really great!!! Mokona want to clean her room because there’s too much cloths (might be including kimono). And you’re right about she needs more space. You’re correct about Ohkawa wanting to wrote TV Drama. sorry for the mistype. At the end, I wanted to write “You’re correct about Ohkawa wanting to write a script for TV Drama”. >And you’re right about she needs more space. but i hate the last episode (22) why Lelouch could do something so stupid like take all the world against him??? thankyou thankyou very much for taking that art! I was trying to find a big version of that art! oh thankyouuuuuuuuuuuuuuuuuuuu!